The C, speaks with Queen Elizabeth during a reception at the UK’s Houses of Parliament in Westminster, London, on 20 March 2012. 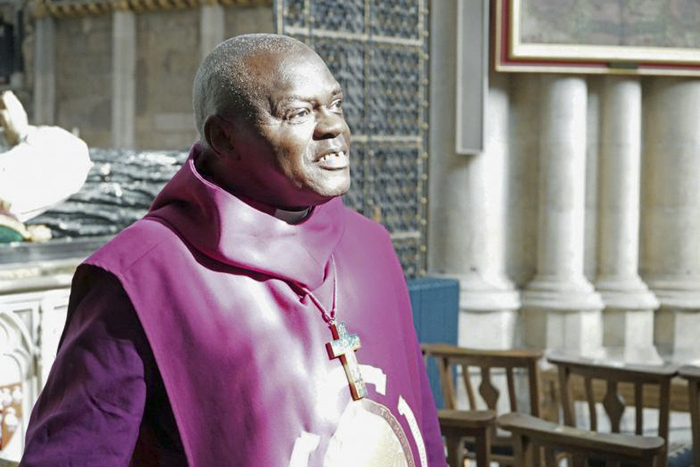 The Archbishop of York, Dr John Sentamu, will retire on 7 June 2020 – Trinity Sunday – three days ahead of his 71st birthday, it was announced today. Church of England clergy are required to retire at the age of 70, but the Queen, as Supreme Governor of the Church of England, has the power in her discretion to extend that for up to one year if she considers that there are special circumstances which make it desirable to do so. Before he retires, Archbishop Sentamu will take part in three pre-planned international mission events. He will also lead “bishops missions” in three northern dioceses: Liverpool, Southwell & Nottingham, and York before he retires. Bishops missions are something he introduced a few years ago, and involves all the bishops of the York province taking part in a weekend of diocesan-wide evangelism events. Within his diocese, he will launch and begin to embed the new diocesan evangelism and discipleship programme, “Reach, Grow, Sustain”; and he will continue his work facilitating discussions on possible political devolution for the Yorkshire region of England, under the “One Yorkshire” plans for possible regional mayoral election in 2020. “I have decided to announce my retirement now in order to provide the Church of England with the widest possible time frame to pray, discern with wisdom and insight and put in place a timetable for my successor and to consider fully the work they will be called to do in service to the national church, the Northern Province and the Diocese of York”, Dr Sentamu said. “I am deeply grateful to Her Majesty The Queen for graciously allowing me to continue as Archbishop of York until June 2020 in order to enable me to complete the work to which I have been called. The Archbsihop of York, Dr John Sentamu, during a mission weekend in York Minster. Before being installed as the 97th Archbishop of York in November 2005, Dr Sentamu served as Bishop of Birmingham and prior to that as Bishop of Stepney, an Area episcopacy in the Diocese of London. Dr Sentamu is a Ugandan by birth; having been born near Kampala. He served as a lawyer in the country, becoming an advocate of the Supreme Court and a High Court Judge. He was imprisoned for speaking out against former dictator Idi Amin and was threatened with death for refusing to clear one of Amin’s relatives of a crime. He managed to flee to the UK with the support of Anglican missionary Keith Sutton, who later became Bishop of Lichfield. Sutton supported Dr Sentamu through his studies at Ridley Hall in Cambridge and, as Bishop of Kingston, Sutton appointed Sentamu to his first ordained post, as Curate of St Paul’s Church in Herne Hill, South London. The Archbishop of York heads one of two Provinces in the Church of England and is known as the Primate of England. In contrast, the Archbishop of Canterbury is known as the Primate of All England. Responding to today’s announcement, Archbishop of Canterbury Justin Welby told Dr Sentamu: “your devotion to Christ and service to the Church of England is something we rejoice in with great gratitude! Previous Previous post: Brexit: an end to diversity in unity?